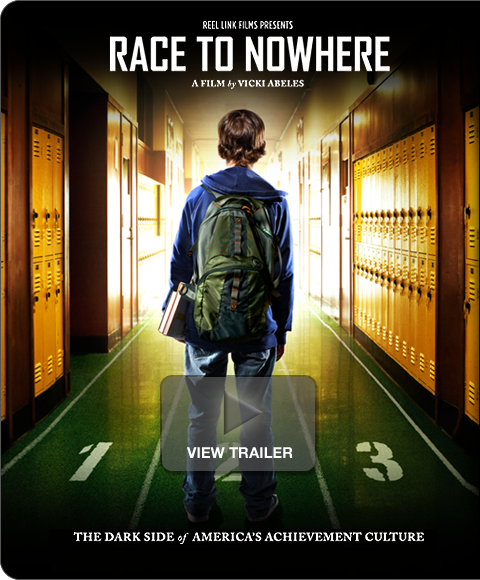 I was fortunate enough to see a screening of the independent film, Race to Nowhere. The filmmakers interviewed students, teachers and parents from across the country to gauge the stress levels of our nation’s families. If you have kids, particularly in grades 6 – 12, you probably already know how overworked and overscheduled our children are. But have you given thought to the ramifications of their stress on you? The film suggested that some schools and families started worrying about getting into a good college as early as first grade! And in order to do that, the student must have spectacular grades, many extracurricular activities, student clubs and community service projects. You may be aware of how much time you’re spending in the car or working on homework with your kids, but have you noticed that their stress levels are sometimes fueled by us, as parents? Whether you work or stay at home, you have a full-time job. You’re already stressed enough. The film pointed out that time spent doing homework has increased from 1 – 2 hours per night prior to 6th grade to 4 – 6 hours between grades 6 – 12. They also pointed out that after 1 – 2 hours, the correlation between amount of homework and academic achievement is zero. Are We Running Our Kids Ragged? Step back from your kids for a minute. No, you can’t directly control how much homework they have, but you do have a say in what clubs, extracurriculars and community projects they are involved in. Do you see anything that can be dropped from their schedules? Are they in some activity because they “should” instead of because they “want to”? If so, I challenge you to talk with your student about paring down his or her daily schedule. Not only will their stress levels go down, but so will yours. And self-care for the entire family will go up! I’m so with you on this. When our girls were small, we limited their extracurriculars to one sport and one other activity. Kept all of us saner and less stress. Sounds like a thought-provoking movie. Thanks for letting all of us know about it, Stacey. Obviously, it really spoke to me. We’ve been encouraging our daughter to lighten up on herself, but she is pretty driven…and anxious. We’re still working on that!